The Stableford scoring system can make the game more forgiving for beginners and amateurs. We take a look at how this golf format works. There is a lot of tradition in the game of golf, and given the hundreds of years the sport has been around it should be no surprise that there is a lot of variety when it comes to the different types of formats that you can expect to encounter. While most of the time golf will be measured in the “stroke play” format (where each stroke you take is counted into your score) sometimes it can be fun, or even necessary to play an alternative format. For that reason, today we will be taking an in-depth look at the Stableford scoring system so that you can participate in it confidently with your friends during your next weekend round. What is the Stableford scoring system? Ok, so how do Stableford points work then? Well, you know how usually in golf the goal is to get the lowest score possible? When you are playing Stableford rules the opposite is true. No, that doesn’t mean that you should start hacking the ball into the woods. The objective in Stableford scoring is ultimately the same: what you want to do is get the ball into the hole in as few strokes as possible. It’s how those strokes factor into your score that is ultimately different. In the Stableford stroke system you count points, rather than strokes, for your aggregate score. Here’s how the scoring breaks down. Not that the numbers on the left are the Stableford points, and the numbers on the right refer to scores in relation to par. Currently, Stableford scoring is not an extremely popular format for tournament play, especially at the professional level, but it is nevertheless still a great way to play a quick and enjoyable round with your friends. 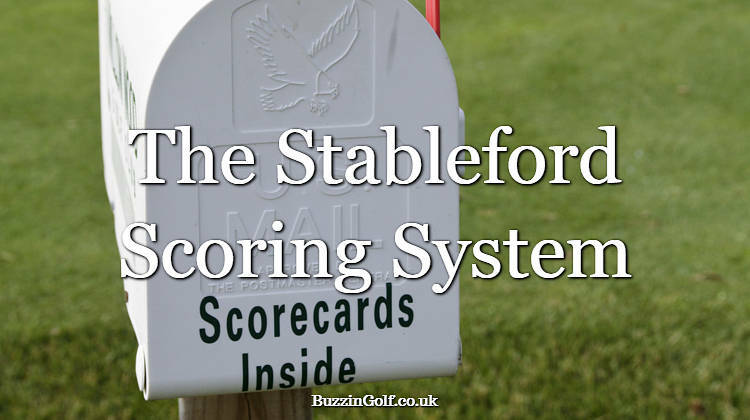 Why use the Stableford scoring system? Good question. Technically speaking you aren’t ever going to actually need the Stableford system, unless you want to utilize it. So the real question then, is why should I want to use it? And the answer is that Stableford scoring makes golf a little bit quicker, and a little bit more forgiving for amateurs. If you will refer back to the reference scale above, you will notice that there is little penalty for a bad hole and plenty of rewards for shooting a low score. If you shoot four over with stroke play (it does happen sometimes, trust me) that will probably throw off your entire round. If you shoot four over while playing Stableford you simply won’t collect any points for that hole, and you can proceed to the next tee grateful for the chance at a fresh start. What’s more, once you hit two over par, you don’t technically even need to finish the hole. You can pick the ball up and head on to the next tee. It’s a great way to speed up the pace of play if that is what you are hoping to accomplish. And, if you are looking for more of a challenge you can also play using the scoring system that is illustrated in the second list that is used in more competitive settings. For this scoring scale, you will be punished a little bit for bad holes, but the damage is still relatively controlled so your round still won’t be ruined by one bad hole. For these reasons, it is a great way to play a competitive round against a friend even if they are a little bit better than you. The nature of the scoring scale keeps the round a little bit more competitive. The handicap system is one of the few ways in which the game of golf makes itself a little bit more beginner friendly. If you are unfamiliar with the golf “handicap” it is essentially a system in which the expectations put on a player are adjusted to their skill level. In other words, struggling golfers could potentially make a six on a par 4 and still make an adjusted “par” on the hole. This system is put in place to allow new golfers to play competitively against their more experienced friends. The higher the handicap that you have, the more strokes you are given a round. Naturally, this system translates quite nicely into the Stableford scoring system, where your points can be adjusted in terms of your skill level. With handicap adjusted scores, you will be able to keep up with your friends and possibly take home a little bit of money the next time your weekend foursome decides to play for a little bit of cash. Golfers in the United States may be disappointed to hear that their chances of finding a Stableford event either in the professional or amateur circles is quite low. For whatever reason, the system is not currently enjoying much popularity in the States and has in fact only been featured once in an off-season event on the PGA tour in the past five years. European golfers may have a little bit more luck trying out this new format in a formally competitive setting. The scoring system enjoys a good deal of popularity overseas, so if you are a European golfer looking take home some hardware using the Stableford system keep your eyes peeled for an appropriate event. As you can see, the Stableford scoring system offers golfers a unique opportunity to play the game in an exciting new way. Will it take the place of stroke play? I’m going to guess that it probably won’t, but if you are looking to spice up the occasional loop, the Stableford format is a great way to do it.